The average time required to pack a single part into a box. The average pack time should be based on the total time to pack the box, including the time to load the parts, add filler if needed, and seal the box. The pack time can reflect the time to manually pack the part or the time required from a machine that automatically performs the packing operations. The pallet is the moveable platform in a milling machine to which the fixture and workpiece are attached. A pallet changer allows another pallet to be loaded with a workpiece and then automatically changed with the pallet supporting a finished part. The pallet change time describes the complete time between the end of a machining cycle and start of the next cycle. Because workpieces are loaded while others are being machined, the workpiece load time need not be included in the machining cycle. A device that may be used in turning machines to catch a part after it is separated from the workpiece by a cut-off operation. The part catch time ( a component of the idle time) refers to any additional time required in the use of this device, such as moving in or out of position and catching the part. 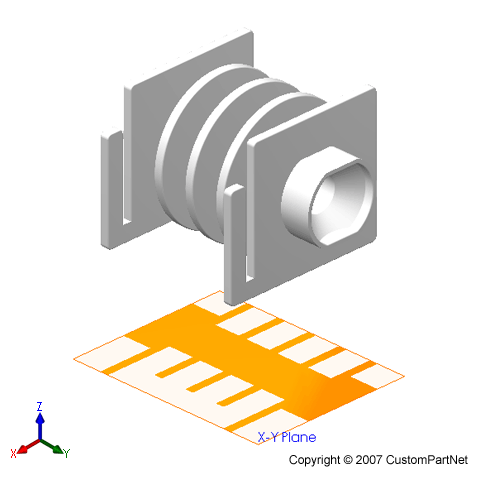 The axis along which the two halves of a mold will separate to allow the part to be ejected. The line along a part where the mold halves separate. In a simple mold, this line will be straight. However, more complex molds may have a stepped or curved parting line. The surface where the two mold halves meet or part. Most parts can be formed by a mold with a flat parting surface. 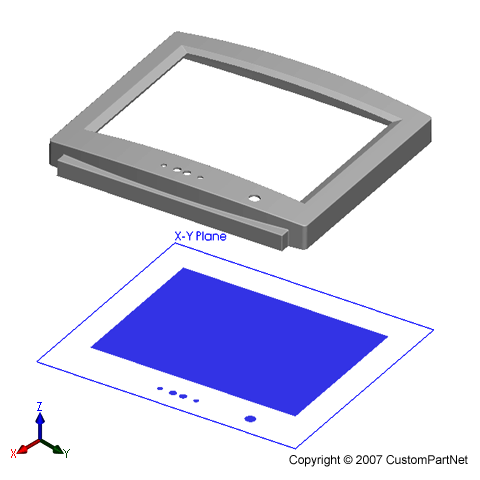 However, more complex parts may require a mold with an angled, stepped, or curved parting surface. More complex parting surfaces will increase the cost of the mold. 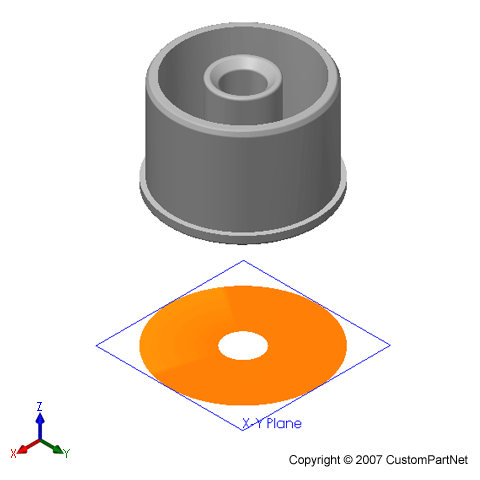 A general classification of the shape of a part. Parts are often first classified by their thickness as being either flat, thin-walled, or solid. Thin-walled and solid parts can be further classified by the basic shape of their outer surface, being either cylindrical, cubic, or complex. 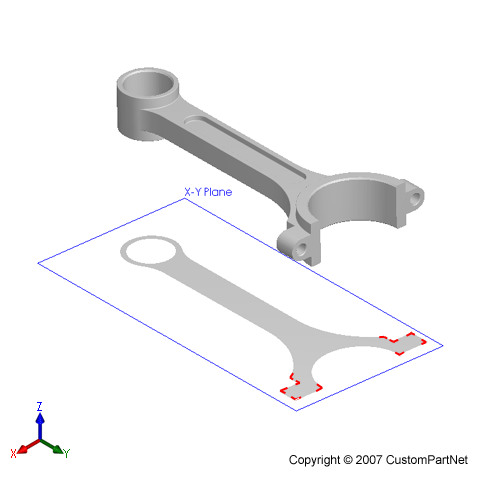 The part shape can help to determine compatible manufacturing processes. For example, flat parts are best suited to sheet metal fabrication, thin-walled parts are typically molded or cast, and solid parts are most often machined or forged. The amount of spacing to be left between the parts when packed into a box, as well as the space adjacent to the side walls of the box. This space can be used to add filler. The number of parts completed in a single operation when the operation acts on multiple parts at once or one part representing many. For example, a painting operation that paints 10 parts at once will complete 10 parts per operation. An inspection operation that weighs a single part out of every 10 parts will also "complete" 10 parts per operation. The "time per part" is equal to the operation time amortized over the parts per operation. 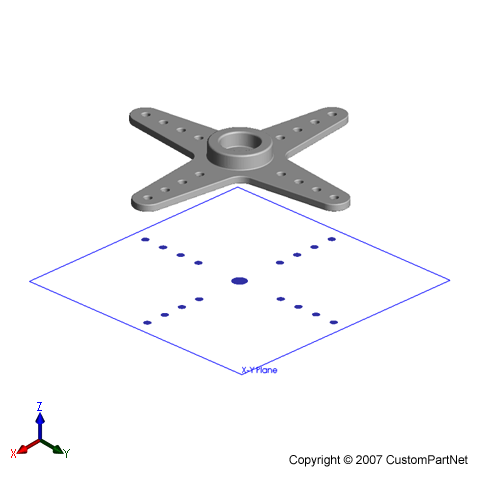 A pattern is a replica of the desired part, used as tooling in many expendable mold processes. The pattern is used to form the shape of the cavity in the mold. Interfaces that are attached to another part and designed to be pushed by the user's foot. The outer perimeter of the projected area of a part. The perimeter of any projected holes is not included. Properties other than mechanical properties, that pertain to the physics of a material and can usually be measured without the application of force; e.g., density, electrical conductivity, thermal expansion, reflectivity, magnetic susceptibility, lattice parameters, etc. This term often has been used to describe mechanical properties, but this usage is not recommended. Parts whose primary function is to allow the flow of fluid or attach to such a part. A large plate onto which a mold half is mounted. Typically, one platen is stationary, while the other is movable. A larger machine typically has larger platen dimensions and can therefore accommodate a larger mold. The absolute value of the ratio of the transverse strain to the corresponding axial strain, in a body subjected to uniaxial stress; usually applied to elastic conditions. If a square bar is stressed in a testing machine in the direction of its length so that the length increases, there is a contraction in each opposite direction, which produces a decrease in the thickness of the bar. The ratio between the contraction at right angles to a stress and the direct extension is called the Poisson's ratio. Its value in steel is in the order of 0.28. Polyethylene Terephthalate (PET or PETE) has excellent toughness and good gas and moisture barrier properties. PET is used to make blow molded food and non-food containers (soda bottles), sheet applications, carpet and textile yarns, strapping, and molding compounds. Post processing refers to any operations that are performed after the primary process has been completed and before any secondary processes are performed. This may include inspecting, trimming, cleaning, or moving the parts. A markup to the production cost, which may be used for any costs not covered by the machine and labor rates, which is typically only the profit. The production quantity or run quantity refers to the total number of parts that are manufactured, which may include any incomplete or defective parts. The defect rate for a given manufacturing process will determine the required production quantity to yield the desired order quantity. The amount of non-defective parts produced by a manufacturing process within a set time period. Typically, the production rate is given as the number of parts per hour. The amount of time required for all machines in use to manufacture the production quantity of parts. The production time includes time when the machines are running (run time or uptime) and when they are down for maintenance or other tasks (down time). The production time does not include any setup time or post processing time. The amount of time (hours) required to program (CNC) or manually layout the instructions for a series of machining operations. This time may include performing calculations, developing the program or instructions, and any testing or inspection that is required. 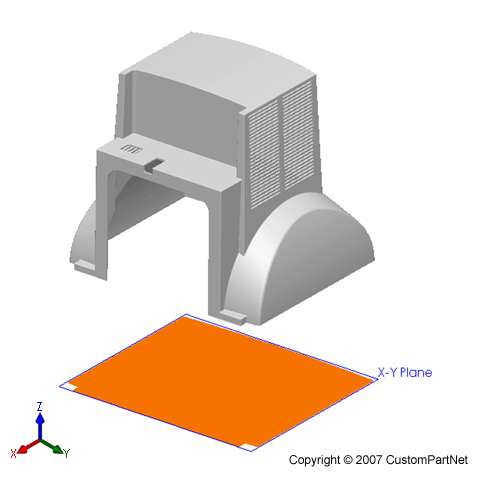 The area of a part or feature that is projected onto the X-Y plane. In molding processes, this is the area projected onto the mold surface because the Z-axis is the parting direction. The projected area can be approximated by a percentage of the X-Y side of the envelope. Any corner that occurs on the projected area of a part. The corner does not need to be 90 degrees, but can be any angle or sharp curve. The number of these corners determine the complexity of the die needed to trim to the part. Projected holes are through-holes that project empty space onto the X-Y plane and therefore appear as gaps in the projected area of the part. If the area projected by these holes is very small compared to that of the part, it can be ignored (Servo lever). For holes that project a larger area (Monitor housing), the area can be approximated as a percentage of the X-Y side of the envelope. A punch is a tool that is forced into a piece of sheet metal in order to shear or deform the material. Punches are available in many shapes and sizes and can be used for a variety of processes. Many punches are cylindrical and the punch diameter determines the size of the hole or pocket being formed. In shearing processes (blanking or punching), the punch has a square edge to shear the material. 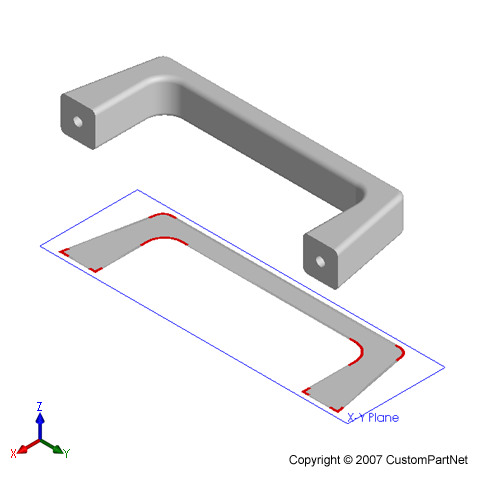 In forming processes (bending or deep drawing), the punch has an edge radius. The total weight of material that must be purchased in order to manufacture the production quantity of parts.